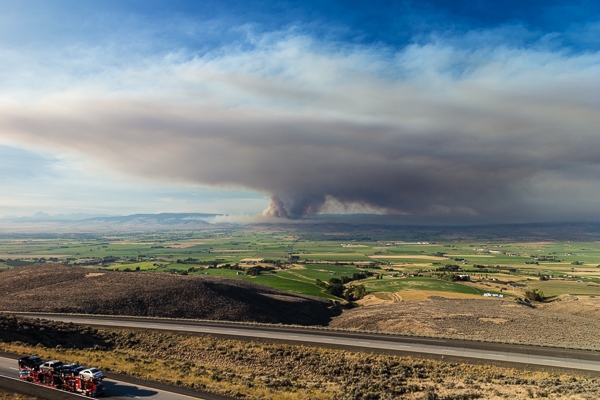 One of many fires in Central Washington this summer. Somebody has a problem with the Ellensburg Rodeo and Kittitas County Fair. Every year he (she?) sends a similar “notice of cancellation” of the Ellensburg Rodeo and Fair with some goofy excuse. Every year it’s not true. It’s not true this year either. Sometimes you can’t make this stuff up. Greetings: My name is Joanna Markell and I’m Editor/General Manager for the Ellensburg Daily Record newspaper. Below are press releases that we at the Ellensburg Daily Record received earlier today and made sure to confirm by direct telephone contact with our fine County Commissioners and other associated officials. The Kittitas County Sheriff Gene Dana Kittitas County and Undersheriff Clay Myers will keep us posted. I’m attempting to notify as many people, and as soon as possible, and also through the best means possible. Sorry about any inconveniences. FOR IMMEDIATE RELEASE: CANCELED: 2014 Labor Day Ellensburg Rodeo & Fair.